As a child growing up in Maine I used to dread the fall because it meant little Debbie had to get the rake and begin to rake all those leaves that fell to the ground and I’d be so tired and weary raking them up and putting them in the wheel barrel and taking them to where my Dad wanted them placed. 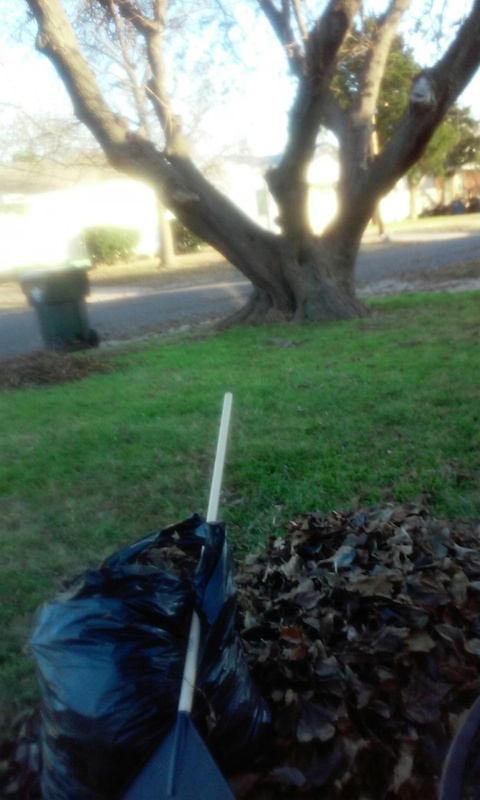 It felt like I’d be raking for hours which I’m sure I was, but my mother would encourage me to rake up the pile as high as I could then jump into the pile of leaves. I never understood why we’d have to rake when the snow would come and just bury the leaves anyway. As a child we just don’t understand certain things sometimes but as we grow we can look back and learn to be thankful for the small things, like that wheel barrel to carry those leaves away. Some people don’t even have a wheel barrel, they have to bag the leaves up and carry those heavy bags to the trash cans or dumps. And my parents were instilling within me a special work ethic and an appreciation for working hard, at the end there comes a reward! Jumping in that pile was fun and My mother wanted me to pile it high enough so that when I jumped in the middle of the pile it wouldn’t hurt as bad when I landed on my bottom. So as I began to rake not only my yard of leaves the other day and began to rake my neighbors leaves because sometimes even when leaves fall they don’t always fall in just “your own yard” I wanted to show my appreciation for good neighbors and sometimes when we need help ourselves you can find your own help, your own blessing when you help others who may not have the strength to rake all their leaves by themselves. Understanding now that the reason I rake my leaves up in the Autumn, is because there is grass under those leaves and when the spring time comes you want a beautiful green patch of grass. The grass has to be able to breathe not being smothered by the weight of dead leaves. It’s constantly re-seeding itself and with every stroke of the rake it begins to till that ground just slightly enough taking with it the old dried dead grass that was no longer needed and makes room for new seeds that in the right season and time, grow beautiful once again in the next season. So what used to be a season as a child I thought was a hard season and meant a lot of work not only raking the leaves but piling up the wood to prepare for those cold winter nights. Autumn is now a favorite season and I’m so thankful for Autumn this year now being in a state that actually we have this season. My children laughed at me at first saying “mommy that was in our garden remember the garden trellis” I told them of course I remember I just went out and took it out of the ground. Reminding them once again that you must be thankful in whatever state you find yourself in because it’s a message to us. Sure it’s not a “tree” children because number one: Christmas isn’t about the tree obviously, but when you can appreciate what you DO have, you will stop complaining and start to open your mind to creativity to come in. They knew we didn’t have money for a fake or live tree and laughed as they watched me with my wire cutters, benders and other tools. 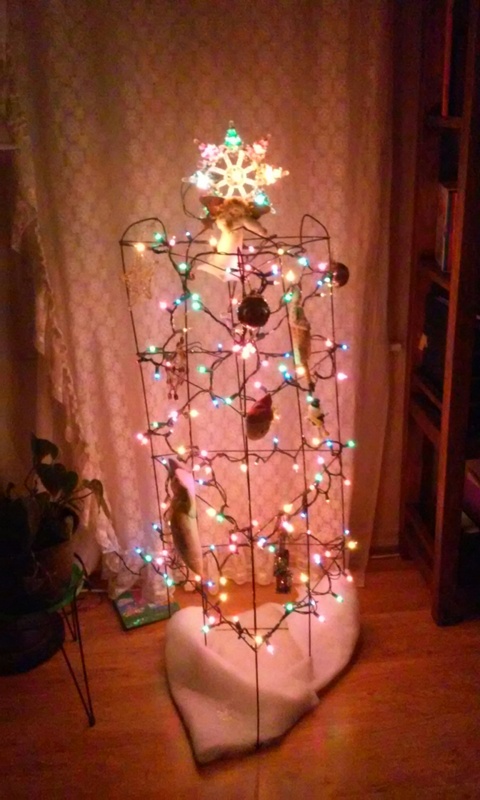 they snickered to each other as I fiddled with the lights we had from years ago, laughed even harder as one light went out and entire string of lights went out, but mommy found that bad one and replaced it and watched in amazement as it lit up the piece of “art” as our Christmas tree. At nightfall when I turned it on my children said, “Wow mom it’s really beautiful”. I had to then laugh and ask them, “Did you really doubt that it wouldn’t be anything less than beautiful? You didn’t see the potential in it because you all you saw was an old garden trellis, but yet now you call it beautiful”. Sometimes we really do have to lead our children by example and sometimes that means we have to shed a tear all over again, just so they take these small things in life for granted. There’s always hope right? Do a few things different this year to instill some of these “old school” lessons into our children. They will be better for it and guess what, we may be reminded of our own roots and begin to be thankful for those small things we count as insignificant..